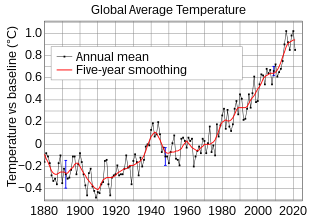 ↑ 2009 Ends Warmest Decade on Record۔ NASA Earth Observatory Image of the Day, 22 جنوری 2010. ↑ Top scientists from a variety of fields say they are about as certain that global warming is a real, man-made threat as they are that cigarettes kill۔ - Borenstein, Seth (9/24/2013). "What 95% certainty of warming means to scientists". AP. http://apnews.myway.com/article/20130924/DA90R44G3.html. ↑ "Joint Science Academies' Statement" (PDF). http://nationalacademies.org/onpi/06072005.pdf. Retrieved on 9 اگست 2010.